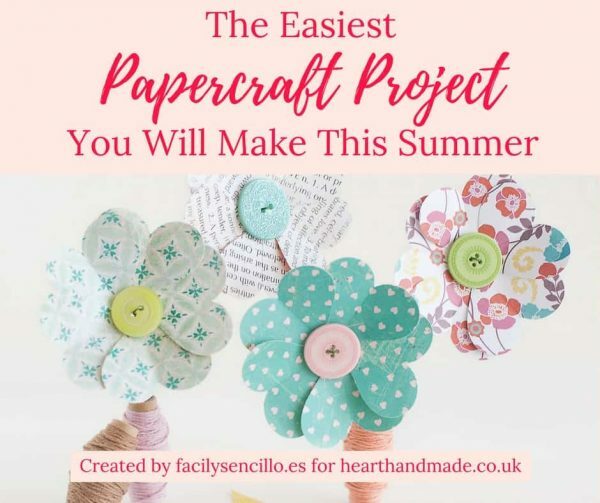 Some of my favourite craft projects are papercraft, it’s so versatile, easy to get started with and the supplies won’t break the bank. 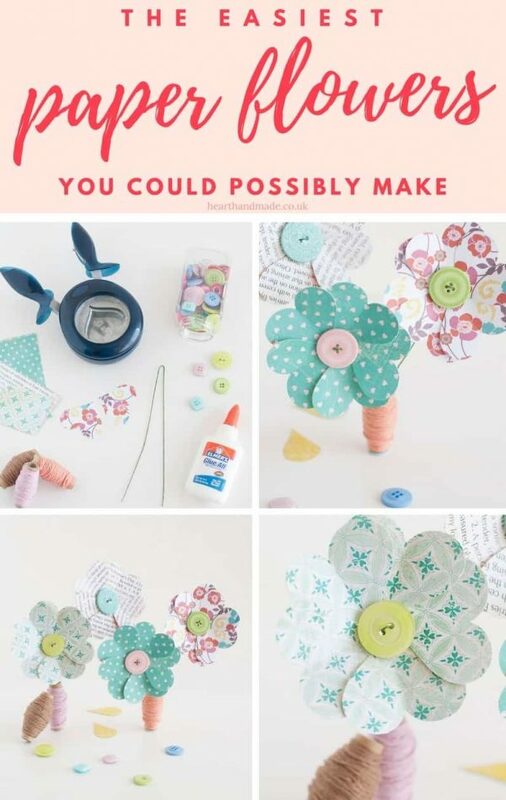 There are different techniques for creating paper flowers. 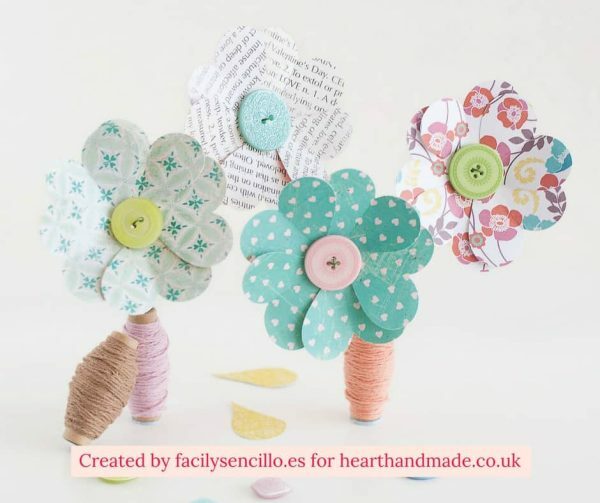 In this tutorial, Anna from Facil Y Sencillo is showing you an easy way to create some colourful and cute paper flowers. You can use them to decorate your home or give them as a gift. There is something special about paper flowers; they brighten up any spot where you put them and … they will never die! If you have ever asked: How do you make flowers out of paper? This papercraft tutorial is for you. 1. 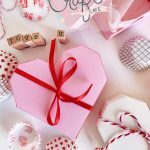 Cut the paper hearts using your punch and fold them in half. 2. Glue the bottom side of the hearts along the edge of a button so that you can still make use of the holes in the middle. 3. Bend a strip of floral wire in half, pass its two ends through the holes of the button and use the resulting two wire sections to create the stem of the flower. 4. 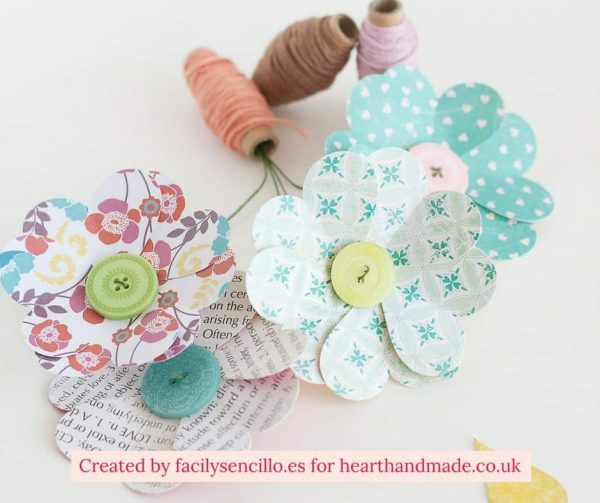 In this tutorial, I use thread spools as a kind of small pots for the flowers. Depending on the size of the spools, you can try to put several flowers in the same spool in order to create a small bouquet. 5. Finally, it’s time to find a place for your flowers. If you want you can also add text to your creation by writing down beautiful messages in some of the petals. If you loved this DIY don’t forget to pin and share using the buttons on the left. I’m sure you can now see why papercraft is one of my favourite types of craft. 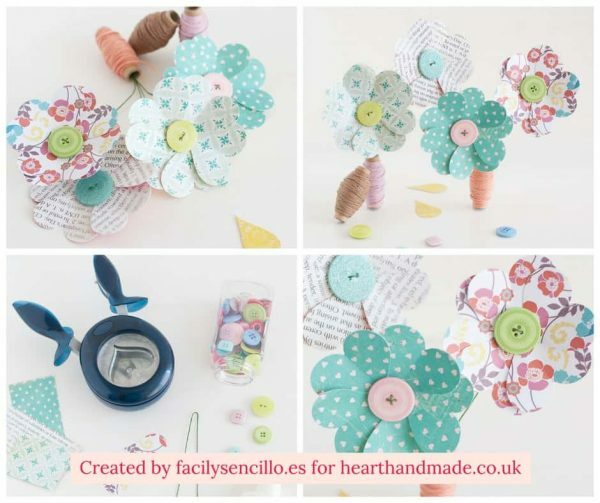 Thank you so much to Anna from Facil y Sencillo for sharing her fabulous paper flower tutorial. 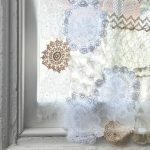 Pop on over to her site to have a look at her store and don’t forget to check out some her other crafty projects. Those are so adorable! My daughter LOVES crafts so this would be something so fun to do with her, I think using the spools as little pots makes them even more adorable. I am excited to try this with my daughter soon! The flowers are beautiful! Love the paper choice too. Thanks for bringing them to Brag About It to share with us this week Claire! Pinned. 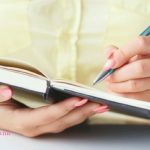 How To Improve Handwriting Skills For Adults That Are Left Handed!